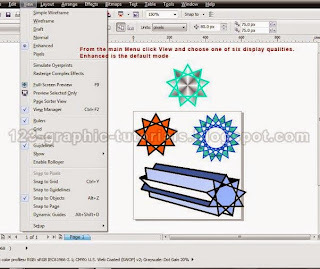 When you are working in CorelDRAW you are using (for the most of the time) vector graphics. In order to display your artwork on the display, your computer needs to rasterize the vectors. Every time you make a change in your artwork, the computer needs to rasterize the artwork and to refresh the displayed image. Depending on the complexity of the artwork, on the type of effects you want to apply, but also depending on your computer's hardware configuration (video card, CPU performance and RAM) this process can be performed in a fraction of a second or in several tens of seconds, or even more (the annoying situations when when the display freezes). If these situations occurs frequently you might consider to change the default viewing mode (Enhanced) and use a less demanding viewing mode like Normal or even Draft (or, even better, to change your computer). CorelDRAW allows you to display a drawing in various viewing modes (from low to high details): Simple wireframe, Wireframe, Draft, Normal, Enhanced and Pixels. Additionally, when the Enhanced mode is activated you can activate two more options: Simulate overprints and Rasterize complex effects. The amount of time required to rasterize your artwork is not the only reason to switch between various view modes: sometimes you will need to use the Wireframe mode in order to locate a hidden object or you'll might need to check the overprinted colours before printing your artwork and in this case you have to choose the Simulate overprints viewing mode. If you want to change the default viewing mode click Tools Options -> click General in the Document list of categories and choose an option from the View mode list box. A happy autumn to all of you!